Tag Archives: Fletcher Construction Co.
From the 1870s to the 1950s, the enterprising Dreaver family made George Street their place of business. Elizabeth Creilman McHoul was born in Glasgow, and worked as a domestic servant before migrating to Otago in 1870. In 1873 she married James Dreaver, who opened a toy and fancy goods store. Mrs Dreaver opened a second family business, the Red Flag Drapery, in June 1877. In November 1878, a fire destroyed eight wooden buildings in George Street, including the Dreavers’ property. No time was wasted in erecting new premises, which opened for business on 22 February 1879. They were built by Finck & Grasby and designed by William Grasby of that firm. Constructed of brick, they comprised a block of three shops with living apartments above. All were owned by the Dreavers, who occupied the southernmost portion. Their first tenants were Miss Vaile, who ran a ‘Young Ladies’ Seminary’, and Hans Pauli, who purchased James Dreaver’s fancy goods business. 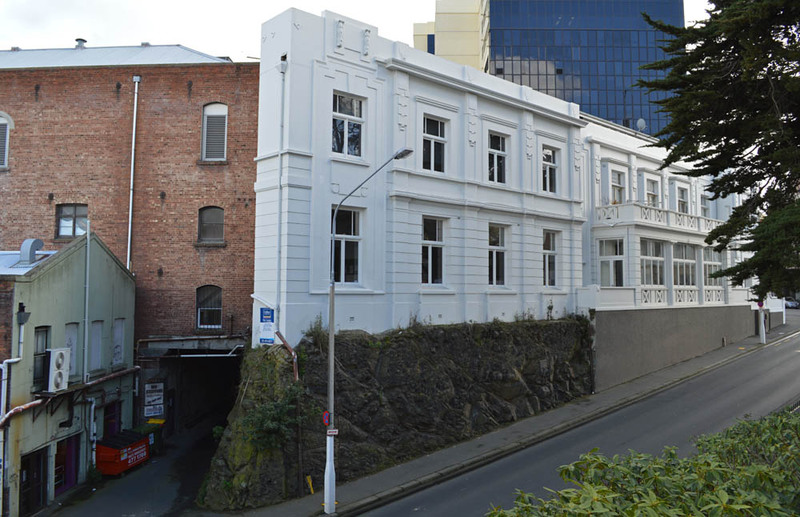 The Otago Daily Times reported that ‘seldom, indeed, are blocks of buildings turned out in such a complete manner’. The flats each had coal ranges in the kitchens, fireplaces in the bedrooms, and gas and water connections. Workrooms for the drapery were built behind the shop, and there were brick washhouses and other outbuildings. The shops had tongue-and-groove linings and were fronted with large plate-glass windows. The cemented facade above was in the simple Revived Renaissance style favoured for commercial buildings at the time. After 137 years the first floor still outwardly looks much the same, though missing are a string course below the dentil cornice, and a modest arched pediment at the centre of the parapet. Elizabeth Dreaver’s early advertisements offered costumes to fit at a few hours’ notice and described the firm as the cheapest house in the city. The Red Flag name was not used after the rebuilding, and the business became popularly known as Mrs Dreaver’s. Stock included dresses, jackets, skirts, mackintoshes, children’s wear, and feather boas. Dreaver’s had its own dressmaking department and became well-known for a parcel post service (with money back guarantee) offered to country customers. Mrs Dreaver was an expert milliner and at a carnival at the Columbia Rink she won first prize from about 100 entries for the most original hat, with a design representing a pair of roller skates. She also won the prize for the smallest hat. Other milliners who worked for her included Miss Graham, formerly head milliner to Mrs W.A. Jenkins, and Mrs Mitchell, who had worked at Madame Louise’s in London’s Regent Street. In 1885 Elizabeth left Dunedin for Scotland, she said due to bad health, and after five months returned with a stock of purchases made in London and Paris. In the following years she vigorously promoted the ‘scientific’ method of pattern cutting that was revolutionising sewing around the world. She was one of the first in New Zealand to import the pattern books of the Butterick Publishing Company, which then had over 1,000 agencies throughout the United States and Canada. She became Otago’s sole agent for American Scientific System of Dresscutting, gave lessons at Otago Girls’ High School, and offered board to out-of-town pupils. By 1893 she had taught the system to 700 people. A Muir & Moodie postcard showing George Street from St Andrew Street. Dreavers is on the right, below the tower. Hans Pauli remained in the northern shop until 1892. His name became familiar to the public through his outspoken opposition to the organised movement for early shop closing. From 1883 to 1903 ‘Professor and Madame’ McQueen ran one of Dunedin’s leading hairdressing establishments from the middle shop, to which they added the Bon Marche children’s clothing shop in 1898. The drapery expanded to take over all three shops in 1904, not long before the death of James Dreaver on New Year’s Day 1905. In the first decades of the twentieth century Elizabeth Dreaver continued to manage the business, which some advertisements described as the ‘Shrine of Fashion’. A hairdressing and beauty salon became part of the operation. In 1920 a new company was formed, Dreavers Ltd, with Elizabeth Dreaver holding 73% the shares and her children Hugh, James, and Catherine, each holding 9%. Additions were made at the back of the property in 1909, and in 1925 Mandeno & Fraser designed stylish new shop fronts, with arches over recessed entrances, and decorative tiles and glass. Fletcher Construction were the builders. A section of this work survives in altered form as the front of the northern shop, where the name ‘Dreavers Ltd’ can still be seen in the mosaic floor. Further rearward additions were carried out in 1944, leading to the saddest event found in researching this story. A shopper named Alice McMillan (58) was killed when a beam fell through a skylight into the mantle department. Elizabeth Creilman Dreaver died at her home in Clyde Street on 30 November 1934, aged 86. Dreavers continued to trade until 1952, its old premises afterwards becoming the Bruce Shop, a retail store for Bruce Woollens. This closed in the mid-1960s, when the name of the block was changed from Bruce Buildings to Perth Buildings. Other businesses to occupy the buildings have included the Otago Sports Depot, a Queen Anne Chocolate (Ernest Adams) shop, Ace Alterations, Martins Art Furnishers, and Don Kindley Real Estate. One shop is currently vacant, while another is taken by Brent Weatherall Jewellers. The third contains the $ n’ Sense bargain shop, which harks back nicely to the toys and fancy goods shop at the beginning of the Dreaver’s story in George Street. A 1925 shop front, surviving in altered form. Decorative windows were removed and original timber window joinery (with more slender profiles than shown here) replaced in 2012. Evening Star, 16 June 1877 p.3 (Red Flag Drapery), 29 November 1878 p2 (fire), 27 December 1920 p.3 (registration of company); Otago Witness, 10 August 1878 p.21 (advertisement), 6 September 1879, p.3 (advertisement), 29 April 1887 p.9 (sole rights), 4 January 1905 p.47 (death of James Dreaver); Otago Daily Times, 22 December 1874 p1 (toy shop advertisement), 15 January 1879 p.1 (description of buildings), 4 June 1879 p.3 (description following completion), 29 December 1884 p.3 (advertisement), 26 March 1887 p.3 (advertisement), 29 August 1944, p.6 (inquest into the death of Alice McMillan), 19 March 2011 p.46 (‘Stories in Stone’); North Otago Times 3 May 1890 p.4 (lessons at Otago Girls’ High School). Baré, Robert, City of Dunedin Block Plans Dunedin: Caxton Steam Printing Company, . Jones, F. Oliver, Structural Plans of the City of Dunedin NZ, ‘Ignis et Aqua’ series, . This entry was posted in Buildings, Uncategorized and tagged 1870s, Drapers, Dreavers, Elizabeth Creilman Dreaver, Finck & Grasby, Fletcher Construction Co., George Street, Mandeno & Fraser, Milliners, Renaissance revival, William Grasby on 4 May 2016 by David Murray. Living in extended peacetime and the relative indulgence of the modern middle class, I find it difficult to imagine how the soldiers who returned from the First World War adjusted to life back in Dunedin, let alone what they had been through on active service. It was only natural that many, though not all, wanted to preserve social bonds they had formed and build new ones based on common experiences. The need for a soldiers’ club was recognised early in the war, and in 1915 a group from the Otago Boys’ High School Old Boys’ Association purchased Atahapara, the two-storeyed former residence of the historian and long-serving local coroner Dr Thomas Morland Hocken (1836-1910). Here on the corner of Moray Place and Burlington (formerly Macandrew) Street, they began the Anzac Soldiers’ Club, and Hocken’s old residence became known as Anzac House. 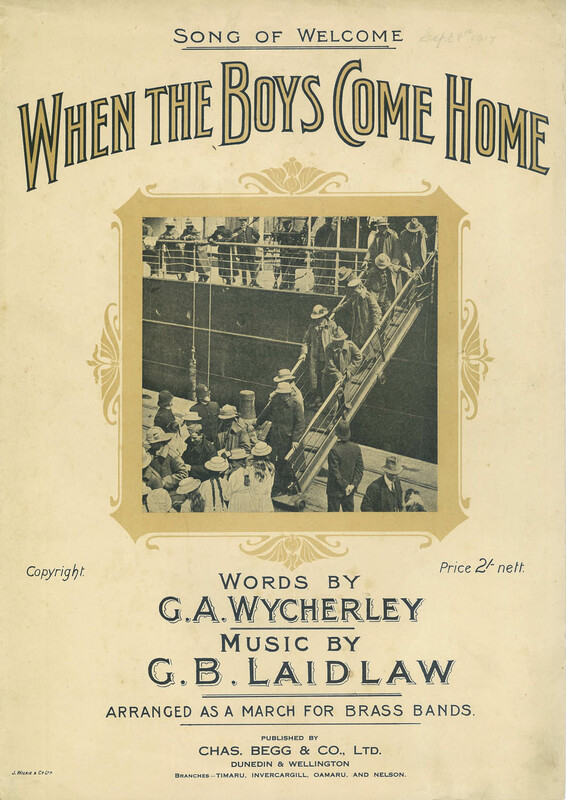 The cover of the sheet music for ‘When the Boys Come Home’, a song written and composed in Dunedin about the return of soldiers from the First World War. The club will be-a two-storeyed edifice in the modern renaissance style, and will be carried out in brick, finished with concrete. The frontage to Moray place will be 34ft, to Burlington street 87ft. The entrance will be at the corner of these streets, and will give access to a wide vestibule, on the right of which will be the reading room, with the offices on the left. The hall leading from the vestibule will give access to the canteen and tea lounge on the ground floor, and to the billiard, board, and common rooms, by means of a wide staircase, on the upper floor. The canteen is to be lighted by a dome roof, and will have a cosy inglenook round the wide tiled fireplace. This may also be used later as a supper room in connection with the social hall, which will be built subsequently, or when funds permit. The spacious tea lounge will be 40ft by 24ft in area, and this will give access by French doors to a covered verandah, occupying nearly the whole length of the Burlington street frontage. A very complete kitchen and servery will be attached to the lounge, and also to the canteen. The billiard room upstairs will be sufficiently large to accommodate four full-sized tables. Hot and cold showers will also be provided upstairs; in fact, the sanitary arrangements throughout the building are to be of the most complete and up-to-date character. The hall, which it is intended to annex to the building at a later date, will be provided with a stage and eating accommodation, up and down stairs, for about 400 people. The exterior decoration of the building, without being of a very elaborate order, will be most imposing, and, with the advantage of a wide street frontage, the clubhouse will have a most imposing and monumental appearance, of which our soldiers and the city generally may well be proud. General Sir William Riddell Birdwood laid the foundation stone on 12 June 1920, and J.H. Walker (chairman of the fundraising committee) officially opened the completed building on 24 June 1921. The Fletcher Construction Co. were the builders and the cost was £8,500. The building covered a site essentially triangular in shape. The style of architecture was transitional, and reminiscent of other Dunning designs including Barton’s Buildings (Stafford House) and the Albany Street flats. Columns, pilasters, cornices, rustication, and decorative mouldings suggest a stylised take on the Renaissance Revival manner, and the term ‘Renaissance’ is found in reports about both this building and Barton’s Buildings. 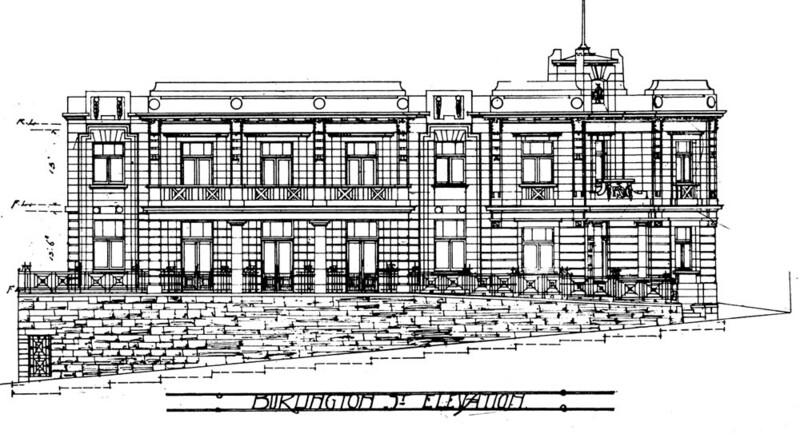 The Burlington Street elevation as it originally appeared, prior to additions and alterations. 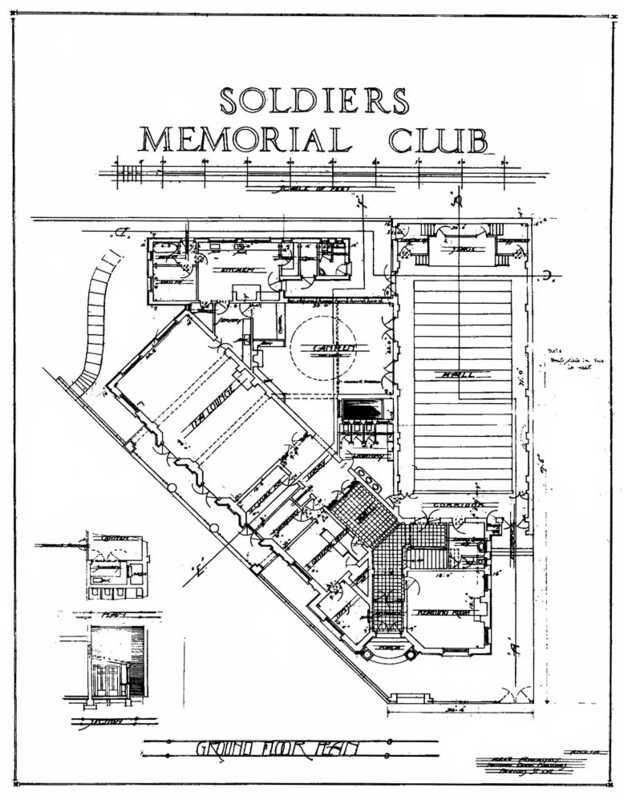 The original ground floor plan. Additions were made 1938, when the ground floor social hall was extended down Burlington Street. The steepness of the street and the rock beneath the additions gave a striking effect to the enlarged structure. The architects were Miller & White, who effectively worked in the existing style, possibly based on drawings left by Dunning, who had died some years earlier. The same firm designed more extensive additions in 1944, but these were not completed for another two years. They extended the first floor to the same extent as the earlier addition, making space for another billiard room. At the same time a miniature rifle range and assembly room were built beneath a new roof structure, increasing the height to three storeys, though the top floor was set back and obscured from the street. Existing internal spaces were also rearranged making room for a lounge, women members’ room, committee room, and recreation and games room. 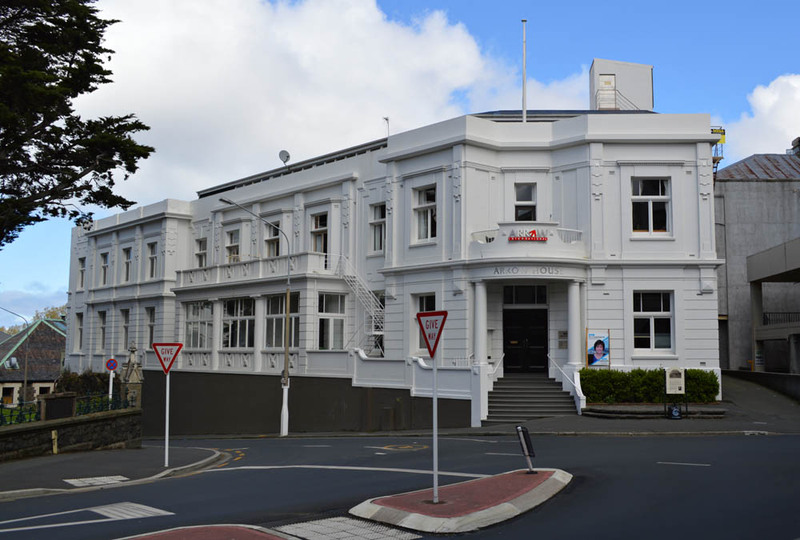 The work was carried out by Mitchell Bros and the redeveloped building was opened by Sir Donald Cameron (Mayor of Dunedin) on 18 December 1946. The redevelopment cost a little over £20,000. A large fire broke out in the early morning of 17 April 1962. 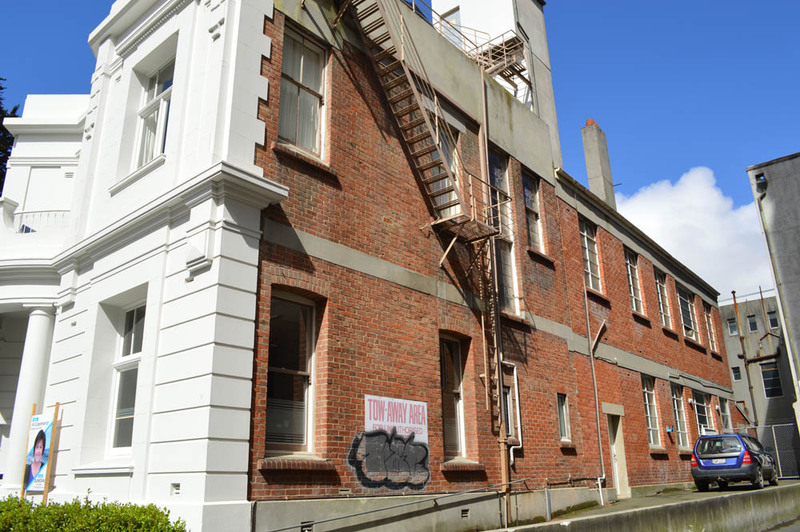 The building was so extensively damaged that the Otago Daily Times initially described it as being destroyed. The following day it was reported that ‘apart from repair work, little structural rebuilding will be necessary on the first floor…but the second floor and roof will have to be rebuilt’. The cost of the damage was estimated at £60,000. Extensive reinstatement work was designed by N.Y.A. Wales (of Mason & Wales). A small corner tower and other masonry and detail at parapet level were removed, and the reinstated rifle range or indoor bowling space on the second floor featured sloping glazed walls. The building was officially reopened on 6 April 1963. Around the same time the RSA acquired the freehold of the land (previously held leasehold from the Presbyterian Church Board of Property). The next major renovations were carried out between 1971 and 1972 at a cost of approximately $70,000 to $80,000. It was reported that the work ‘will modernise the clubrooms, turning the second floor into an area for social activities and extending the charter activities throughout the first floor, except for the offices and reading room’. A permit for glassing in the balcony was issued in 1978. 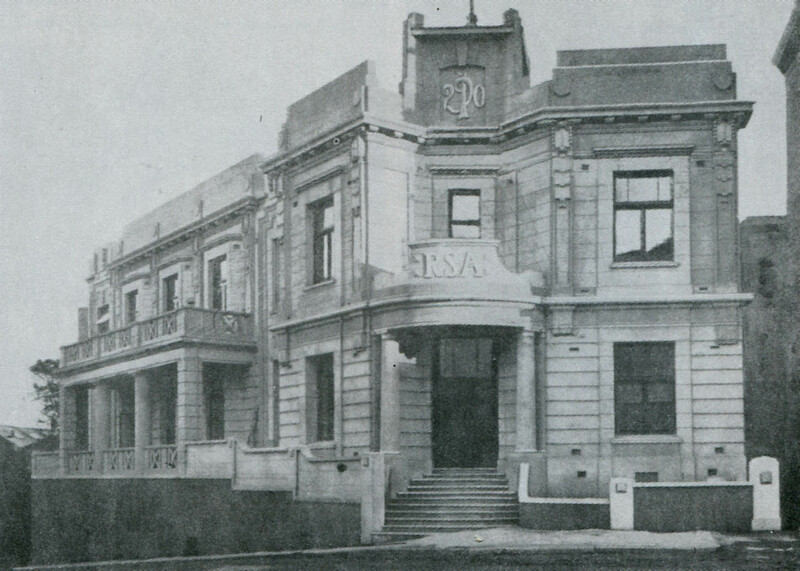 After facing a financial crisis, the Dunedin RSA sold and vacated the building in 1996. In 2009 it was extensively refitted as commercial office space for owners Beach Road Limited (Grant McLauchlan). 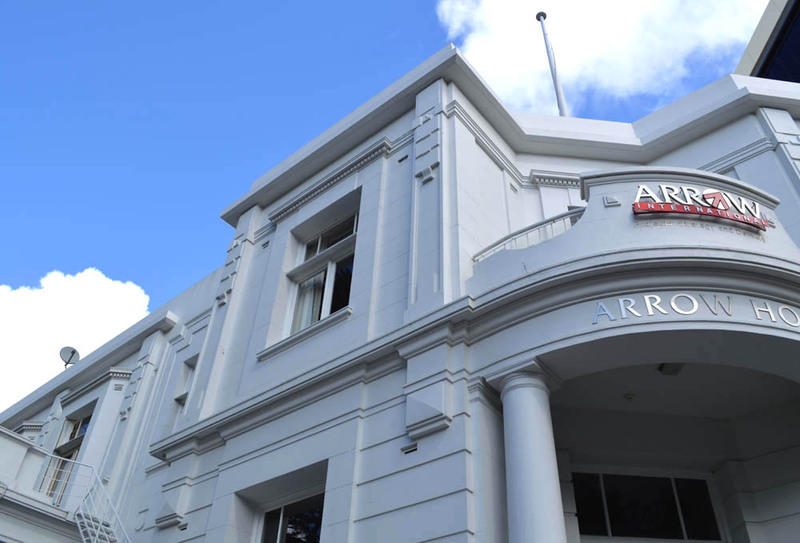 It was subsequently renamed Arrow House after its anchor tenant, Arrow International. This entry was posted in Buildings and tagged 1920s, Burlington Street, Fletcher Construction Co., Mason & Wales, Miller & White, Moray Place, RSA, W.H. Dunning, Wars on 6 April 2014 by David Murray.